At JDR Design, we aim to ensure a lifelong sense of enjoyment and fulfillment from every space we improve. No matter where you live, we know your home is a sanctuary. Our goal, is to turn it into your temple. We understand the importance of a well design space, and how it relates to your business success. We are eager to assist you with your hospitality project. Together we can ensure your guest have a memorable time. A trendy downtown loft gets a sleek kitchen. This once listless and uninspiring space, was transformed into a sophisticated and warm bachelor pad. Although the whole space received a full remodel, the new kitchen area was really where the soul of this residence was reborn. The rich quarter sawn oak custom designed cabinetry, along with the colorful, dimensional tile, gave this kitchen some much needed warmth and substance. Echo Park cottage gets the HGTV treatment. JDR Design was recently approached by HGTV to be part of their highly successful and popular series HOUSE HUNTERS RENOVATION. It was a great opportunity for us to showcase our work and have quite a bit of fun while doing it. 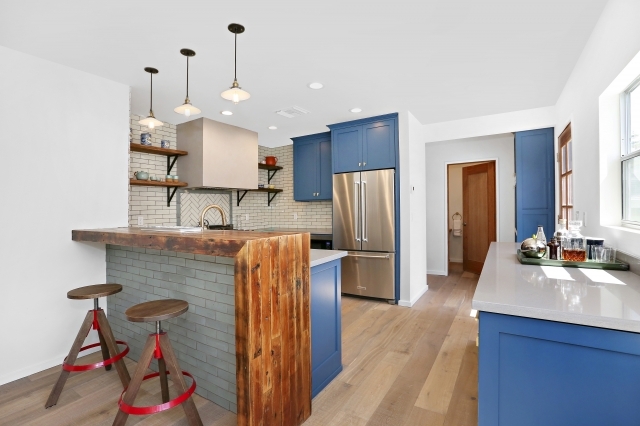 The Baxter St kitchen project consisted of a complete redesign and remodel of the existing kitchen space. The existing small kitchen space and adjoining dining area lacked personality, warmth, and above all, functionality. Through a very conscious study of the space, as well as closely listening to the clients requests for the new desired space, JDR design was able to provide these proud new owners a very successful layout and most importantly, a highly functional kitchen and dining space. A mid-century modern residence gets a modern update. The design directive for this project was simple; update the original 1960's kitchen, and create better flow between the kitchen area and the adjacent dinning room space. New sleek cabinetry, along with top of the line appliances brought this kitchen back to life. Removing the partition wall between the two spaces created a sense of growth, but more importantly, it improved the flow between the two rooms. Toluca Lake House gets a full makeover. What was once four separate spaces consisting of, two living spaces, a dinning room and very small galley kitchen, became one open space with much improved flow and functionality. This was another full home remodel, where the kitchen and living space interaction was the main focus. The end result was an amazing space, where homeowners and guests can interact harmoniously while taking advantage of the open floorplan. A new life for an old survivor. The Rockland Ave project was most definitely a labor of love. We took on this dilapidated structure, riddled with illegally and poorly built additions, and gave it the attention it deserved. After the full demo and remodel, plus a sizable addition, we were able to give this old survivor a new lease on life. A canyon ranch home receives a new kitchen. This canyon ranch home kitchen was in desperate need of some love and attention. 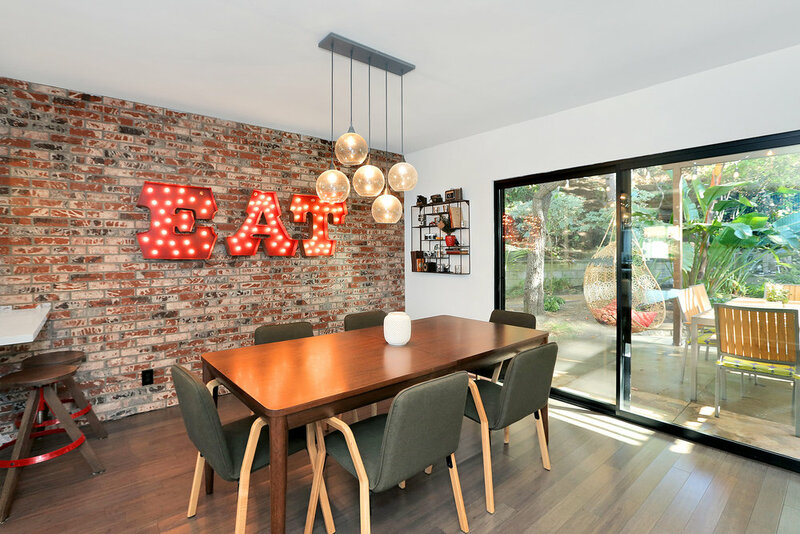 The once dark, and cramped kitchen space was transformed by opening a couple of walls, bringing in new custom made maple cabinetry, high end appliances and much needed lighting. This kitchen definitely brought back the soul of the home, and is now a much more functional and inviting space to share with family and friends alike. A new Headquarters for a global footwear company. Skechers USA, a global force in the footwear industry received a brand new headquarters location in Manhattan Beach, CA. We were lucky to be part of this massive undertaking, and providing this rapidly growing company and it's family of employees, fresh and efficient designed office and showroom spaces. Additionally, other projects with Skechers USA have included tradeshow space design, as well as merchandising display units for it's product.